One day, while crossing the street at a familiar San José corner, you wonder why the intersection feels bigger than it used to. 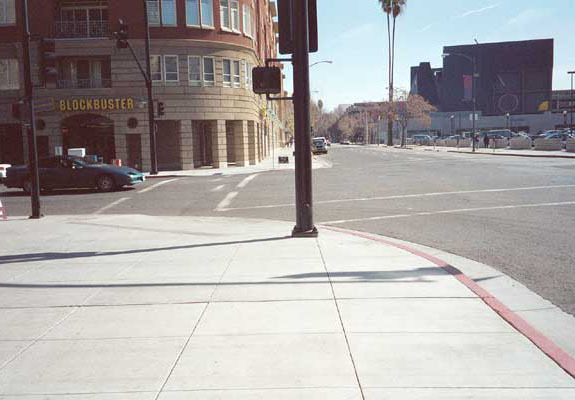 When intersections are rebuilt in San José, they are often rebuilt with wider, rounder corners so that cars can speed around the corners better and faster. It's just one of many ways to remind you that cars are more important than people in San José. If you're walking, watch out! For example, this corner at San Fernando and 3rd was recently rounded off so that hurried drivers don't have to be so careful while turning anymore. A city is the sum of its parts. One corner at a time, it gets a little worse for pedestrians in San José.